2015 Open Mic Poetry Reading & Arthology Celebration. Wednesday, April 22. 12:00 p.m. in Speakers’ Corner. Class of 2015 Creative Writing Contestants, other students and members of the University community will share original work and favorite poems, ranging from the humorous to the thought-provoking to the sublime. This event will also feature the release party of Arthology, one of Villanova University’s student art-literary magazines, which will be available to students for free. Giorgi Japaridze, PhD, a professor of Computing Sciences in the College of Liberal Arts and Sciences, has been selected as the recipient of its 2015 Outstanding Faculty Research Award for his scholarship in logic and computer science. The award recognizes a faculty member who demonstrates the highest standards of excellence in research, scholarship and contributions to their field. The Outstanding Faculty Research Award will be formally conferred at the University’s May 15 Commencement ceremony. In addition, Dr. Japaridze will speak about his research in a public talk at 2 p.m., April 21 in the Falvey Memorial Library Reading Room on campus. The talk is co-sponsored by Falvey Memorial Library and the Office of Research and Graduate Programs. 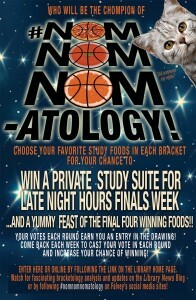 The Elite Eight of #NomNomNomatology have been chosen! Be sure to vote for the winningest foods in some intensely delicious match-ups right here, or vote in person at the front desk in Falvey! April is Poetry Month. Check in daily for new verse!